Dons lost 1-0 at home to Port Vale earlier this season. 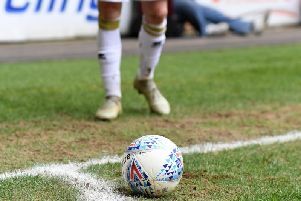 Games between Port Vale and MK Dons are notoriously tight, and this Saturday’s match-up at Vale Park is unlikely to be any exception. Just two goals have been scored in the last three meetings between Dons and Vale, with a win, loss and a draw each. The last game saw Vale leave Stadium MK 1-0 winners back in October. And given both sides’ current form, it should be another close encounter in Burslem on Saturday. "It's a big game for us," said Dons manager Robbie Neilson. "They've got a few injuries recently, but they've also brought a few players in. "Michael Brown has come in in the interim and has them playing slightly differently, so it's a bit of an unknown for us, but I think if we go up there and play well, I expect us to win the game." Dons head to Vale Park with an almost identical record to that of the Valiants - picking up one win in their last six and having their FA Cup run ended away at Championship opposition last weekend. However, while neither carry much momentum into the game, both sides are battling at the bottom of the League 1 table and know a win would do their chances of edging away from the drop zone no end of good. Dons currently sit 18th in League 1 with 28 points, while Vale are within touching distance in 15th on 31 points. But after being knocked out of the FA Cup last week to Brighton, Neilson feels his side will benefit from concentrating solely on the League 1 campaign. He added: "The league is the most important thing for us. We've got a few weeks of just playing Saturdays, so we can train hard and get ready properly."